The School of Law, KIIT (deemed to be University), Bhubaneswar is conducting a Certificate Course on Legislative Drafting from 7th April 2018 to 11th April 2018. Drafting is one of the major necessities in the legal profession. Different aspects like research manner, impact and outcomes of legislative drafting through the lens of traditional best practices and the emerging trends in the 21st century are some of the areas the draftsman should focus on. 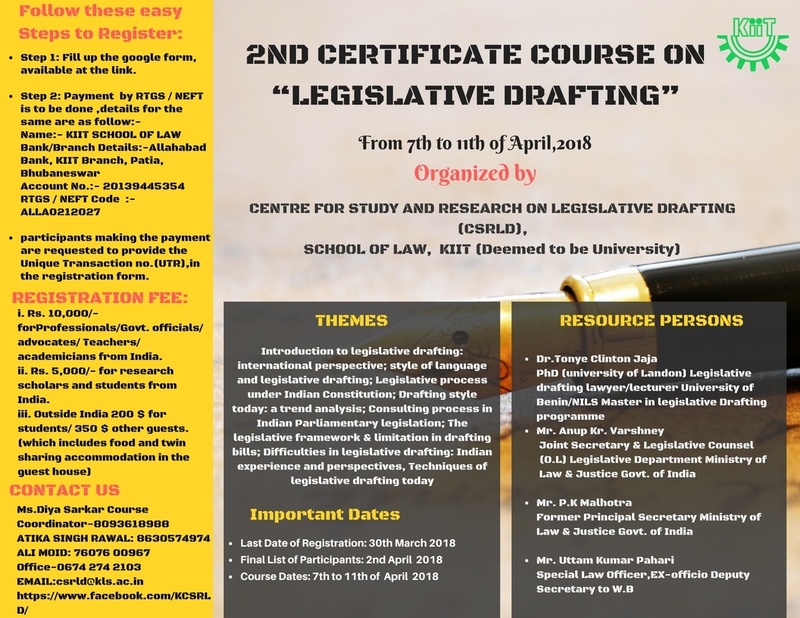 With the same aim of equipping the draftsman with this latent essential skill to yield expertise and specialised professional etiquette in the pitch of drafting, the Centre for Study and Research on Legislative Drafting, School of law ,KIIT (deemed to be university) through this Course envisages not only to prepare skilled professionals in the legal field but also to nurture the law makers with adequate knowledge of making laws. Introduction to legislative drafting: international perspective; style of language and legislative drafting; Legislative process under Indian Constitution; Drafting style today: a trend analysis; Consulting process in Indian Parliamentary legislation; The legislative framework & limitation in drafting bills; Difficulties in legislative drafting: Indian experience and perspectives, Techniques of legislative drafting today. i. Fee for the course is:-Rs. 10,000/- for Professionals/Govt. officials/ advocates/ Teachers/ academicians from India. ii. Rs. 5,000/- for research scholars and students from India. iii. Outside India 200 $/ 100$. The course fee includes food, lodging and study materials during the course. Fees to be payable by RTGS / NEFT and participants making the payment are requested to provide the Unique Transaction no. (UTR) in the registration form. Maximum intake would be 50 participants on first come first serve basis. The last date for online registration closes on 30th March 2018. Final list of participants: 2nd April 2018. Course dates: 7th April – 11th April 2018. Certificate to be provided to each participant. Detailed program of the classes shall be communicated in due course. Step 1: Fill up the google form, available at this link. Step 2: Payment is to be done by RTGS / NEFT to the below account. Participants making the payment are requested to provide the Unique Transaction no. UTR) in the Google form. For Facebook Page click here.